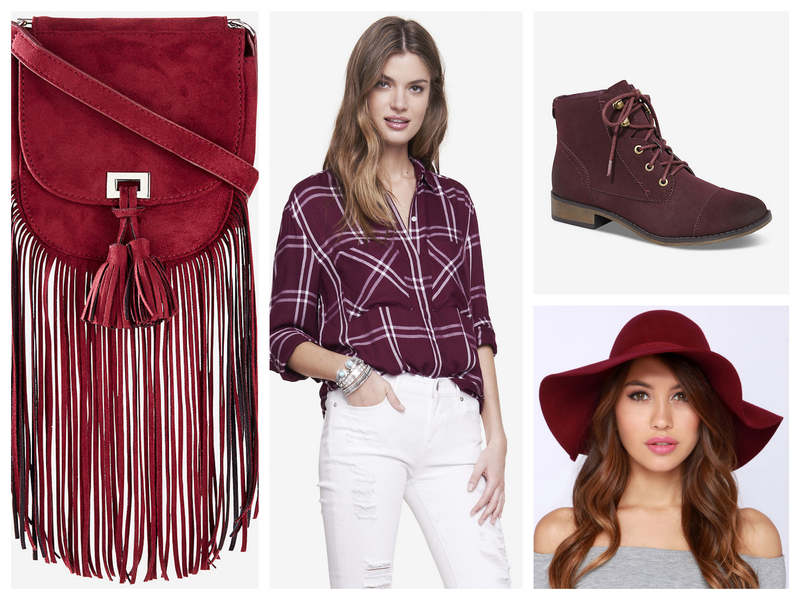 Burgundy is huge for this coming fall, so I am sharing my favourite burgundy pieces that can be added to any wardrobe! This colour is so beautiful and a perfect compliment to a neutral outfit! You can even spice things up with a burgundy lipstick, or nail polish, one of my favourite colours to wear in the fall! Express Wine Fring CrossBody Bag l Also comes in Black $30 Fringe is also huge for the upcoming fall season and the combination of this colour and style will be fab with any outfit! LuLu Carmen Sun Diego Burgundy Floppy Hat l Also comes in Black Brown & Grey $32. Floppy hats are so chic and I love the thinker felt material that can double as keeping your noggin warm and looking on point! Express Distress Lace Up Ankle Boots l I love love love ankle booties and in burgundy these are a must. I love that they are flat, they could be worn with shorts or a skirt in later summer and will transition into fall beautiful with jeans or leggings! Express Oversized Windowpane Plaid Shirt Plaid is an absolute must for me in the fall and the combination of this colour and pattern are perfection. I also love the length and cut of this tunic style that can be paired flawlessly with jeans or leggings.